Finding a tire for sport coupes and sedans that not only offers high performance, but is also value priced can be difficult at best. Fortunately, the Dunlop Direzza DZ101 manages to do this and more. The Direzza name is also used with Dunlop’s Direzza tires on the Japanese Super GT Championship, making it a tire that utilizes world class handling and grip with the best tires on the road. The Dunlop Direzza DZ101 has a special silica and carbon black compound called the Silicon Matrix, which helps the tire to grip the surface as well as provide surprisingly good comfort at the same time. The directional tread design and strong shoulder blocks result in excellent handling and good steering response. When you look closely at the tire you will see two tread channels which have slanting grooves that also help in the corners and increase grip. Beyond that, these tread channels also provide superior traction and a lower risk of hydroplaning on wet surfaces. You may find yourself being surprised with the comfort level of this Dunlop model. This is due in part to the 5-Pitch Technology that is used. It minimizes road noise and enhances driving comfort. Inside the tread you’ll find two super strong steel belts which are further strengthened by a nylon cap ply that is spirally wound for added strength. This not only gives the tire better stability at higher speeds, but increases treadlife and offers a smoother ride. If you drive your vehicle at high speeds on the highway you will appreciate the great handling characteristics brought about by the Direzza DZ101. Other notable features on the Direzza DZ101 include Dunlop’s Max Flange Shields, which protect your expensive alloy wheels from getting damaged from curbs. The Shields get hit first in order to also protect the sidewall of the tire. 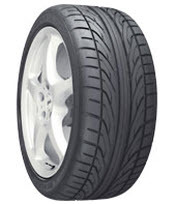 Overall, the Dunlop Direzza DZ101 is a solid choice for car enthusiasts. It has excellent handling and traction on wet or dry pavement, and it’s hard to beat the value for the dollar. Prices for the Dunlop Direzza DZ101 range from around $85 for 15 inch series tires to $158 for the 22 inch series tire. Who Are Dunlop Direzza DZ101 Tires Designed For? The Dunlop Direzza DZ101 is designed for drivers of all types of sport coupes, sedans and compacts, who want a high performance summer driving tire that not only performs well, but comes in at an incredible value compared to other tires in its class. As you might expect from a high performance summer driving tire like this Dunlop tire, they do not have a treadlife warranty. However, you will find a tire uniformity guarantee on the Direzza DZ101 for 6 months or the first 2/32 inch of wear. Materials and workmanship are backed for 6 years and include free tire replacement during the first year or first 2/32 inch of wear. Dunlop follows that up with a prorated amount for the remaining time period or down to the last 2/32 inch of useable tread on the tire. You’ll also get Dunlop’s 30-day pledge guarantee that guarantees your satisfaction with the tires or allows you to exchange them.